in the meantime, I tried my hand at making a few kanzashi. I really want to break out an iron, and see how the folding goes if I do crisp presses. I think right now the thinner fabrics work best. i've done 5 other flowers, but I haven't finished them off yet, so I'll show y'all later. this isn't gross, it's actually just pictures of peoples' fingers that end up looking like butts. I found it horribly amusing. ooohhhh... that turned out great! Can't wait to see what else you churn out! That hair pin is beautiful! It's beautiful! I wish I had some fabric around to play with to try it out, but I got rid of my boxes of stash when I moved recently! How beautiful! Sorry to hear your wrists hurt, but glad it's not carpel tunnel. At least you have other cool crafts to keep you busy. 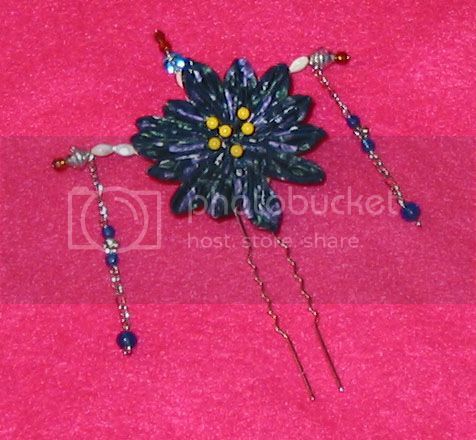 Your kanzashi is gorgeous. Can you tell us a bit more about them? I did some googling and got that they were hair ornaments used in traditional Japanese hairstyles. One of the websites also said that each style in which they are worn has a particular meaning. How do you wear them?